September: the holidays are, for most of us, a nice memory now that school has started, or we are back to work. You had a nice relaxing stay at the beach or you went the more adventurous path? Travel memories are precious: a nice album with photographs can make you dream away years later. A collection of postcards, which you bought with the intention to send to family and friends but at the end didn't had time to find where to buy the post stamps. I know the feeling. Or did you came back with some souvenirs? What than seemed the perfect thing to buy, can look completely wrong once you arrive at home. Objects are perfect in the surrounding where you bought them, but don't necessarily match in your home. You didn't get seduced when they made you a great offer, and now when you are back home you want to create a bit the feeling you had during your holiday. We can add little touches to our home to bring back memories without re-decorating our house in a complete different style. I choose three destinations to show that wherever you go there are always small things, perfect to bring home with you. In a lot of countries you can find beautiful ceramics: simple pieces, colourful antique pieces or objects done by artists. Each country will have his specific style, colour, textures. Plates which you can use on a daily base, a small vase which is the perfect little piece to create a wonderful still life. Or a big vase or object to show in a glass cabinet or on a shelve. And each country will have its own traditional things, it can be folklore or ethnic. When I think of Japan than the sublime packaging or wrapping of gifts come to my mind. The simplest object wrapped, with an eye for detail in a colourful paper can be that perfect little gift to bring with you for somebody. The printed papers can be put in a frame and hang on your wall as a piece of art. Maybe you can find some vintage printed silk scarfs. If you are handy and creative you can even make a small handbag out of it. Or you can use it to wrap a gift. The holiday period will soon be there. The Japanese are very talented in prints, and woven fabric. We know them too for beautiful and minimalistic objects. Every piece is made with a lot of taste, perfect proportions and not one detail to much to be able to blend-in in their homes. And not to forget the colourful and playful accessories. So why not to buy a game or a toy as a colourful touch in your home. Paper lamps are available also here, just take a look at IKEA and you will be able to buy some for very little money. You can personalise it by adding some ribbons, painting some small motifs. Or you go for a more refined design lamp, which found its inspiration in the paper lamp. When Japan stand for refinement, zen, minimalism than we can say that Mexico stands for colour, joy de vivre, playful, and passionate. Colourful objects will bring for sure joy in your home. But take care: this explosion of colours can be beautiful in summer but think how it will look in the middle of winter in your home. Ok, you can always hide it in a cupboard during the cold winter months, or enjoy it even more when you miss the warmth of the sun. Colourful table accessories and kitchen utensils are a perfect way to create a summer feeling. Mix colours and prints, it will never be to much. Don't be afraid the plates are not all them same, this makes it even more perfect. 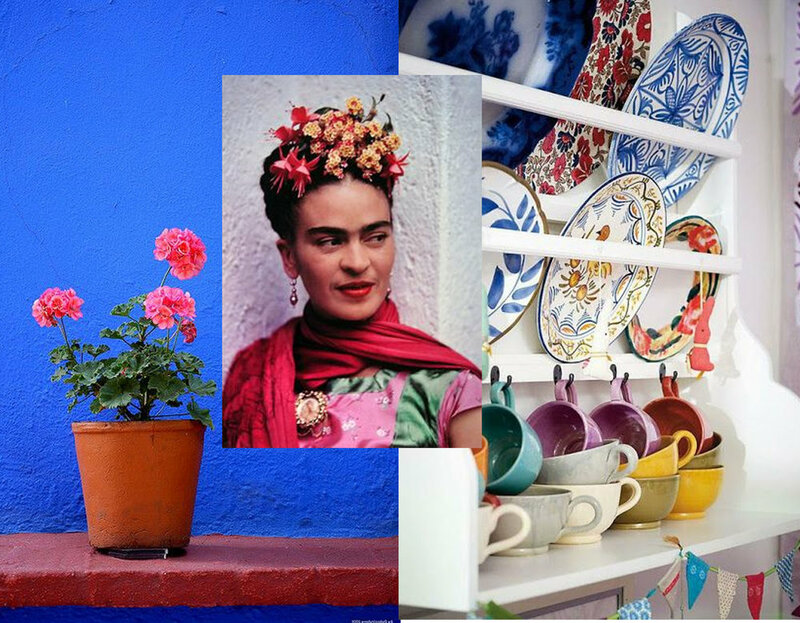 You can start a collection of plates: buy one in every country or town you visit. Soon you will have a unique wall in your home. A good idea for as well a classical as a bohemian interior style, in your kitchen or dining area. Fabric is another thing you will find in each country. Embroidered table cloths, printed and/or quilted bedcovers. They will look even more astonishing when you have more of them, in winter they will be perfect for keeping you warm in front of the TV. In summer they will look great when put together on an pile. Look for some hand made blankets, table cloths or some garments. Rugs can be a bit more challenging to put in your suitcase, you can buy some small ones and put them randomly together in the living for a bohemian touch. Woven baskets is a typical summer accessory. We can see ourself going to market every day to buy fresh fruits and vegetables for dinner later that day. You can find basic baskets where you live, and during a rainy weekend you can add a touch to bring the holiday mood in your home. By now you must know that Romania is close to my heart. It took me time but I got to love this country little by little. There is still so much to discover, in the small village tradition is still a vivid part of the peoples life. Younger people are discovering their heritage. On local fairs or markets you can find a nice selection of ceramics, wood craftwork and textiles. New or vintage. The museums often offer also some old pieces, specially, embroidered garments and rugs. A wooden bowl, wooden spoons, are hand-cut: use them decorative or enjoy serving salads with a pair of bigger spoons. When you treat them with oil they will get even more beautiful in time. Young designers are getting inspired to bring Romanian traditional motifs in a modern way. For those who are creative the embroideries can be an inspiration to make a big drawing on the wall. You see how a traditional motif can get very modern? Your style is modern, even minimalist: give it a try by adding one piece of furniture in your home. A complet re-look by just adding one piece. Use colour, and no, it won't look as if you have inherited your grandmother's wardrobe. Traditional rugs are very easy to integrate in your home. It can give just that touch of glamour to your bedroom or make your modern home even more interesting.